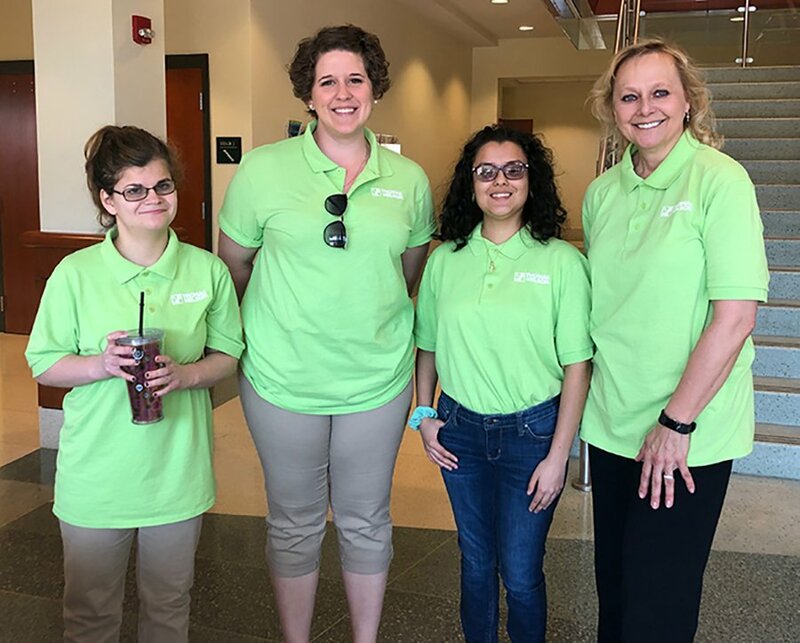 From left: Presidental Ambassadors Grace Mackert, Sara Gochenour and Diana Hueso, along with Michelle Manfred, the Director of Information Services. Volunteering has been a big part of the Thomas Nelson experience for many years. There’s even an entire section for “Community Service” under the “Campus Life” tab on the landing page of the College’s website. There are nearly 50 businesses and organizations listed for students to serve, most of them off campus. Michelle Manfred, Director of Information Services, added another on-campus opportunity in January: Presidential Ambassador Program. Manfred said it’s an extension of an idea Thomas Nelson President John Dever has of students greeting students. The program's positions include welcoming students to campus, representing Thomas Nelson at area schools, conducting campus tours and taking on leadership roles. Manfred has already lined up a number of opportunities through the May 9 graduation ceremony, with more to come in late May and June. Several ambassadors were on hand for Thursday’s open house at the Historic Triangle campus. Grace Mackert, a Social Science student taking classes at the HT campus, learned about the program from Manfred. “I’m a friendly person so I really wanted to help people,” said Mackert, who added this is the first program at Thomas Nelson she’s gotten involved with. Sara Gochenour, a paralegal student, was looking to volunteer and saw the Ambassador Program as a good way to get connected to the College because she's an online student. In addition to benefiting the school, the program benefits students. If they complete 15 hours of community service as a Presidential Ambassador, they earn $100 toward tuition, receive a free Thomas Nelson polo shirt and have a chance to improve their communication skills and meet college administrators. Those last two aspects can yield big dividends, Manfred said. All of that can lead to better communication in the event a student encounters problems with a professor, administrator or even a fellow student. Manfred, who worked in Workforce Development from 2005 until moving into her new role late last year, has six ambassadors at the Historic Triangle campus and another five or six in Hampton. And she says she gets more emails from interested students every day. “I’ve been pleasantly surprised, and pleased with what I’ve seen so far with the students that are coming forward,” Manfred said. Manfred hopes the program, eventually, will offer assistance in offices all across the College’s two campuses, including the president’s office. For more information on the program, call Michelle Manfred at (757) 825-3524 or email her at manfredm@tncc.edu.